SACRAMENTO, Calif. — Native American tribes, commercial fishermen, recreational anglers and environmental groups have won a huge victory here. The ruling by Judge Parlen McKenna is a big victory for Klamath Basin Tribes, commercial and recreational fishermen and environmental organizations that are pushing for removal of four dams on northern California’s Klamath River in order to restore salmon, steelhead and other fish to the watershed. “The judge affirmed what we have been saying for years — the river is in a lot of pain caused by PacifiCorp’s dams,” said Steve Rothert of American Rivers. PacifiCorp, recently acquired by billionaire Warren Buffett, had challenged the prescriptions of the U.S. Fish and Wildlife and National Marine Fisheries Service. The judge made his decision after hearing 45 hours of testimony here over a five-day period and reviewing thousands of written pages and exhibits. The ruling occurred during a week of activity in the relicensing process for PacifiCorp’s dams. On Sept. 25, the Federal Energy Regulatory Commission (FERC) issued a draft environmental impact statement recommending only modest changes to current dam operations and a “trap and haul” program to drive fish around the Klamath dams. The next day, a California Coastal Conservancy report concluded that dam removal could be done safely and affordably without leading to floods or exposing the river to toxic sediment. The judge’s ruling could force FERC to amend the impact statement to include a recommendation that the dams install fish ladders. Dam removal would cost PacifiCorp and its ratepayers less than installing fish ladders, according to FERC’s own analysis. FERC estimates the annual cost of removing Iron Gate and Copco dams at approximately $14.4 million, including power losses. In comparison, the annual cost of installing fish ladders, screens and other passage measures as required by fisheries agencies is estimated to be $16.6 million — $2.2 million more than dam removal. The decision found that fish passage measures would benefit salmon, steelhead, lamprey eels and redband trout by providing access to 58 miles of habitat between the four dams. The 58 miles would also include 46 miles of habitat for the threatened coho salmon. Fish passage would also open the way to reintroduce salmon, steelhead and lamprey to more than 300 miles of historic habitat above the project. 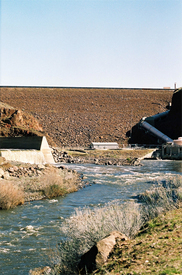 The exclusion of these fish from the upper basin began with the completion of the first dam on the Klamath in 1918. Comments on FERC’s draft environmental impact statement are due in 60 days. The current license expires in March 2007. Tribes, fishermen and other basin stakeholders will resume settlement negotiations with PacifiCorp next month. Klamath Basin tribal members and other residents will gather Oct. 25 at the State Water Resources Control Board, 1001 I St., Sacramento, to ask the board to “clean up the Klamath and save the Klamath salmon.” After a peaceful demonstration at 12:30 p.m., a public forum at 1 p.m. will hear testimony on the importance of the Klamath River and salmon. For more information, call or e-mail Klamath Riverkeeper Regina Chichizola at (530) 627-3280 or klamath@riseup.net.